Three cups of coffee can get the job done, but, unfortunately, none of these are true. Eating breakfast is important. If done right, it helps us feel full so we snack less during the day and helps kick-start the metabolism, so you can burn more calories as the day goes on. Multiple studies have shown that people who have been successful with significant weight loss (losing 30 or more pounds and keeping it off for at least a year) are avid breakfast eaters. About 90 percent of these individuals eat breakfast at least five days a week. Whether your goal is weight loss, managing cholesterol, or just getting healthier overall, breakfast is an essential part of your morning routine. Lucky for you, fitting a healthful breakfast into your morning is easier than you may think. Follow these tips to get you started and stock up on these winning breakfast ingredients. Just one apple won’t get the job done in the morning. To keep from snacking later, you should eat somewhere between 300 and 400 calories for breakfast. If you’re counting calorie intake, don’t worry. The right mix of breakfast items will kick-start your metabolism and you’ll burn as much as you take in while avoid snacking in the process. Your daily breakfast should include two to three foods, including at least one item from the grain food group, dairy food group, and fruit or vegetable food group. The good news is that there are infinite ways you can mix foods from each of these food groups into mouth-watering meals. Although most people forget this vital breakfast component, protein should be a high priority on your ingredient list. Protein gives your body energy, helps burn fat, and keeps you full longer. The cherry on top? Protein is actually pretty easy to slip into your favorite breakfasts. Experts suggest you aim for at least 5 grams of protein in every breakfast, so reach for whole grains, nuts, eggs, low-fat dairy, and lean meat in the morning. And if you can’t fit in one of those, soy protein powder is a great alternative. When you eat more fiber than sugar, like you probably do with your favorite breakfast cereal, you feel hungry sooner and risk a sugar crash early in the morning, prompting you to gobble up sugary snacks. Fight those urges by swapping your ratios and making sure your fiber intake beats out sugar. Another way you can stave off early afternoon munchies is to add a little fat to your breakfast. Note, you only need a little. A simple switch from non-fat Greek yogurt to 2 percent-fat yogurt (find 6-ounce Wester Family yogurts for 3 for $1 at Reams) or adding nuts or avocado to your meal can hit that mark just fine. Mornings can be hectic, but that’s no excuse for skipping breakfast. Plan ahead by prepping additives or cooking whole meals beforehand. Chop veggies for an omelet and store them in tupperware containers to make omelets an easy morning meal, or prepare a frittata the night before and eat it throughout the week. If you enjoy morning smoothies, you’re better off making your own than choosing premade mixes that can be high in calories and sugar. Make ziplocks of your ingredients before the week begins so you can simply dump and blend on your way out the door. Superfoods can become your secret weapon in the morning. They contain many of the vitamins and minerals you need every day, in addition to fiber and protein. Plus, studies show that regularly ingesting superfoods can help reduce your risk of heart disease, diabetes, and cancer. 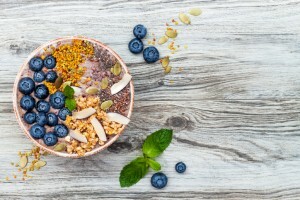 Superfoods that are perfect for breakfast include nuts and seeds (quinoa included), berries (especially blueberries, which are high in antioxidants), oats (go for old-fashioned oats instead of instant), soy, tea (green or black—makes a great coffee substitute ), and low-fat yogurt. Take some time to experiment with morning meals to find the staples you can’t live without. To get you started, we compiled five winning breakfasts that will get your day going on the right note. Two eggs guarantee your 5 grams of protein. Those watching their cholesterol should have three egg whites or egg substitutes instead. Note: Forget about adding butter and salt. Cook eggs with olive oil and season with pepper, but no salt. Reach for two or three varieties of berries, fresh or frozen. Layer them on top of 2 percent-fat yogurt to keep you full until lunch. Top it off with a handful of nuts and seeds to get your recommended dose of protein. Squeeze a superfood into your oatmeal by adding pumpkin puree. Toss in a little pumpkin pie spice to flavor the dish. Add almond or soy milk to get more protein in your bowl. Fry two eggs and season with a dash of salt and pepper. Sandwich between a whole-wheat English muffin or bagel with a slice of low-fat cheese. Note: If you need to send the kids off to school with a good breakfast, wrap the sandwich in tinfoil so the cheese melts and kids have a to-go meal to eat on the bus. Mix in a whole banana, sliced. Use soy or almond milk and make sure you sip the bowl clean to get your recommended amount of protein. You can also sprinkle in some vanilla protein powder for an extra boost. Now that you know your breakfast basics, you can simplify your menu and make each morning meal your favorite part of the day. Get all the goods you need for a rockstar breakfast at Reams and enjoy unbeatable savings on your favorite foods.